Thunder, lightning and pouring rain in Stillwater NJ , just started 5 minutes ago ! This upcoming weekend may be interesting. Quietace wrote: This upcoming weekend may be interesting. It certainly does. 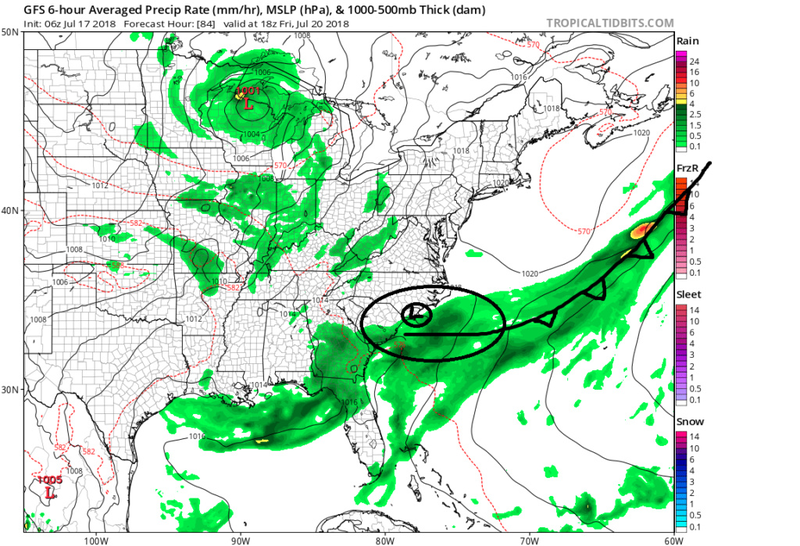 Looks like there will be some left over energy sitting off the SE coast following the passing of the front Tuesday that possibly spins up as a subtrop or trop system as we head into the weekend. 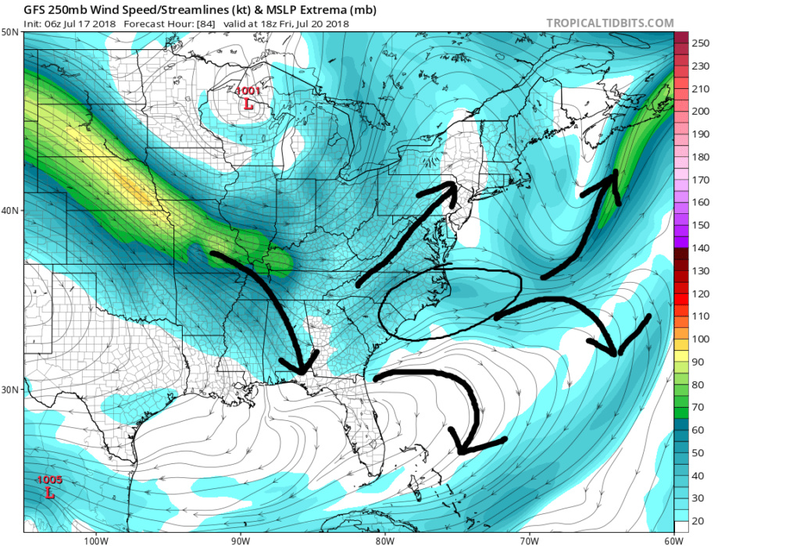 An approaching long wave trough, neg tilted if your the euro, draws it in. The approaching trough and building W Atl ridge has the EC sandwiched in the middle tapping into a deep trop/sub trop moisture fetch regardless for the weekend into next week. Parts of the area could get quite a bit of rain. 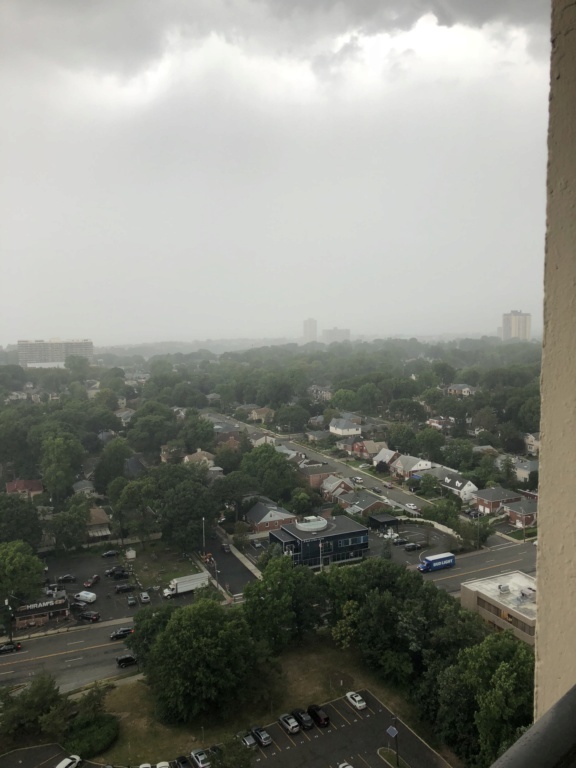 I am not sure about formation potential, however, I would agree with you that the area will feature more of an enhanced moisture feed scenario with heavy downpours and widespread significant rains. I think you may have to watch surface winds as well (nothing damaging, but gusty onshore flow). Also, guidance is leaning towards an almost stationary pattern of some sort during days 6-10, which would also feature more precip for the area. I will have to take a closer look at this in the AM. Also, Tstorm threat tomorrow looks promising. The likelihood of a true top cyclone is admittedly low, but if you believe the Euro you can see the little dollop of energy that gets left behind from Tuesdays departing trough and subsequent frontal boundary. The next trough tilts neg as it makes its way through the GL. Do not be surprised later in the week if the energy Im referring to gets a yellow shade and a low prob of development on the NHC site. 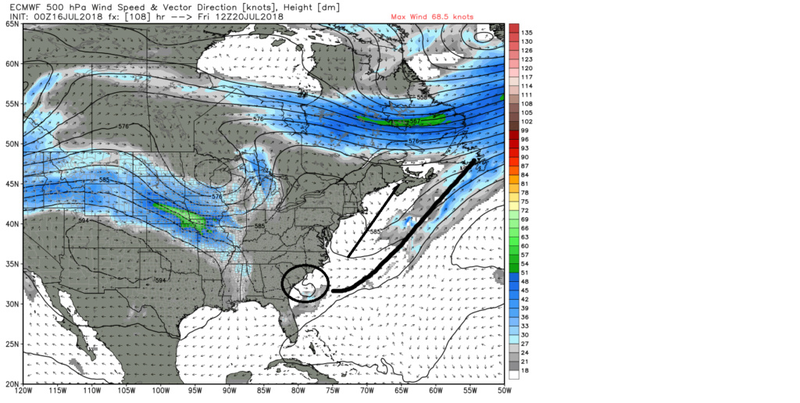 There could be some rapid strengthening to LP just off the NC/SC/Ga coast. Either way it will have a deep trop/subtrop moisture fetch and like you said gusty if not gale type winds associated with trop down pours with a neg tilted trough. wait we might get hit by a tropical system or just rain associated with tropical moisture? Thunderstorm threat todaylooks promising too. 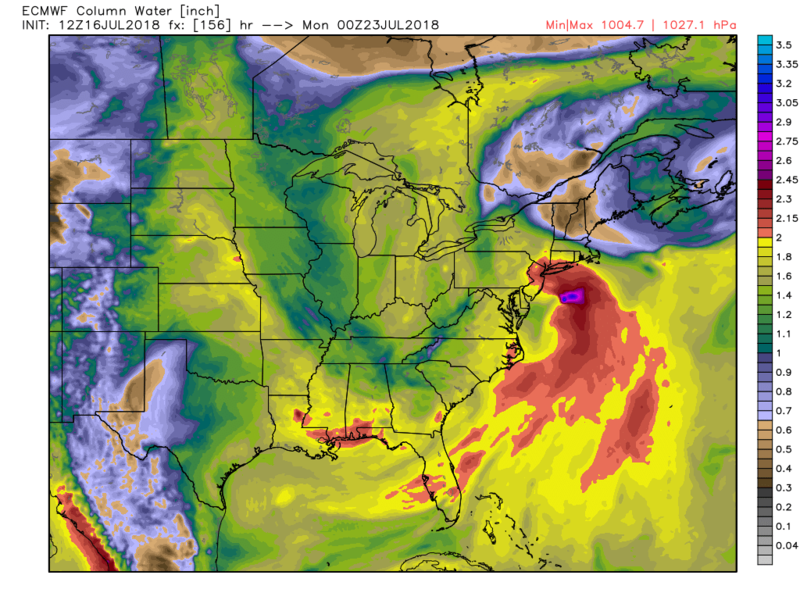 That's a lot of rain in euro for late weekend. Does sat look ok? What kind of totals over the weekend might b expected? I guess I been out the loop. Flash flood watch today skins. I hope holds off till we get the kids on their busses. Most likely a system that is tapped into tropical moisture, but there is a slim chance of trop or subtropical development. I don't actually think there will be enough time for it to develop true trop characteristics before the approaching trough phases with it and keeps it "cold core" therefore by definition it isn't a trop. system. That said the moisture feeding into it will originate from the deep subtropics, GOM so will be moisture laden. See below maps: surface, 500mb, 250mb. 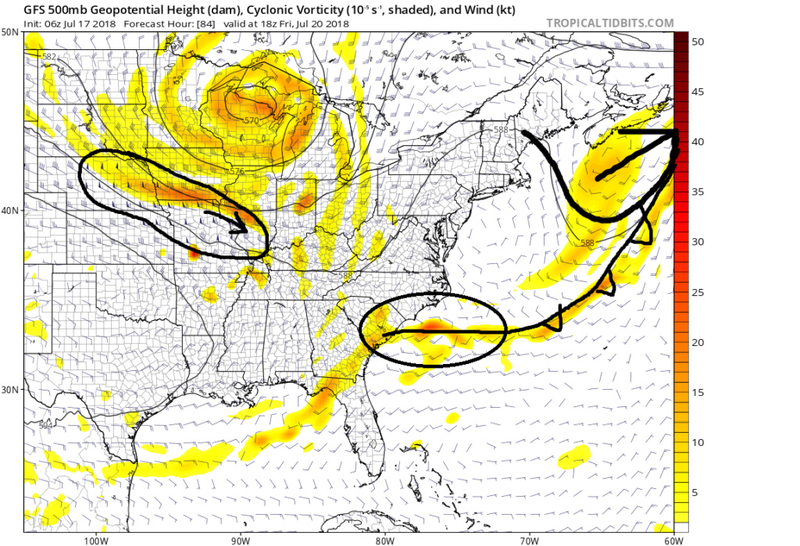 As you can see below by Friday, after the front that we will experience today passes, there is leftover energy sitting off the NC/SC coast at 500mb (yellow map). There is a weak surface low sitting along the coast as a result. Notice the 250mb. The arrows indicate decent outflow or upper air divergence which enhances rising air at the lower levels. as this entire feature drifts N/NE over water the water is warm enough, although not boiling by any means, to support enhancement of LP deepening. The enhanced lifting mechanisms will support thunderstorm development which could cause feedback and a warm core development. The question is how much can it deepen before it begins to interact with the approaching trough. Once that happens any warm core characteristics will quickly transitions to cold core as the trough phases with the system. 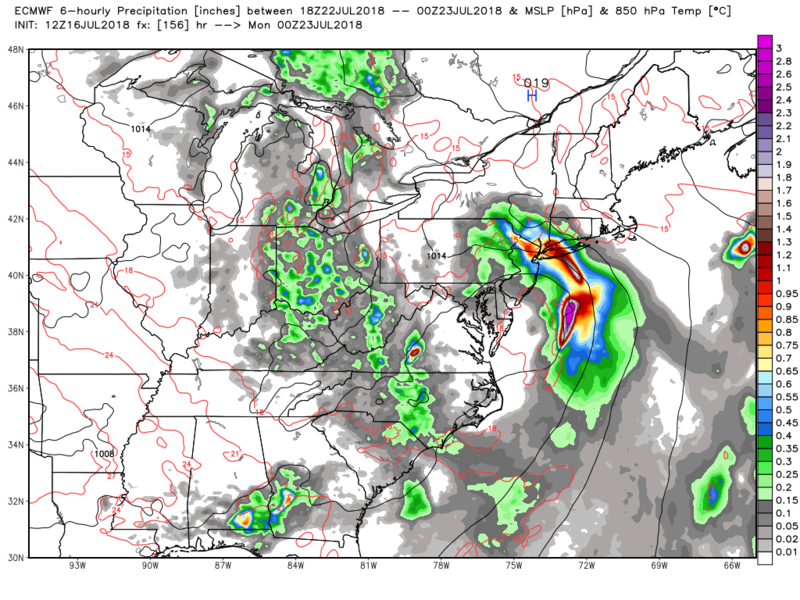 Again the chances are slim for this to happen, because I don't believe there will be enough time and the SST are not quite warm enough for rapid intensification, but either way the phasing will bring very heavy rainfall and very strong gale force winds into the region for late weekend. Im almost certain of that. My initial call will be by Thursday or Friday we will see some color on the NHC site for "a small chance to develop into a trop system. I'm all for a good non extreme rain and some wind storm. Beats this boring weather. What's the timeframe? Will sat into Sunday midday be okay? jmanley32 wrote: I'm all for a good non extreme rain and some wind storm. Beats this boring weather. What's the timeframe? Will sat into Sunday midday be okay? Hope it holds off till Sunday night. Too many weekends this past spring have been washed out already. Its been so dry here not sure bout over there. 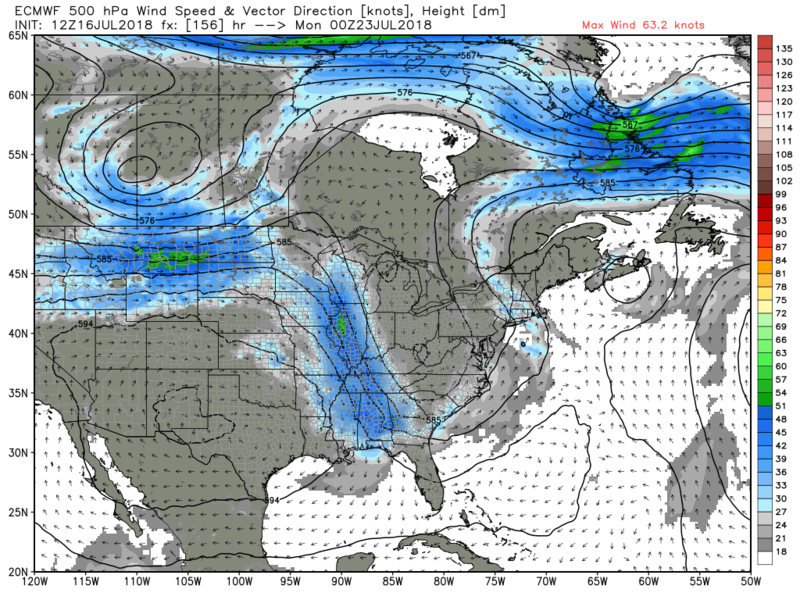 Interesting run with 12z GFS run. Shows a more consolidated/stronger tropical low development with direct impacts over our region. 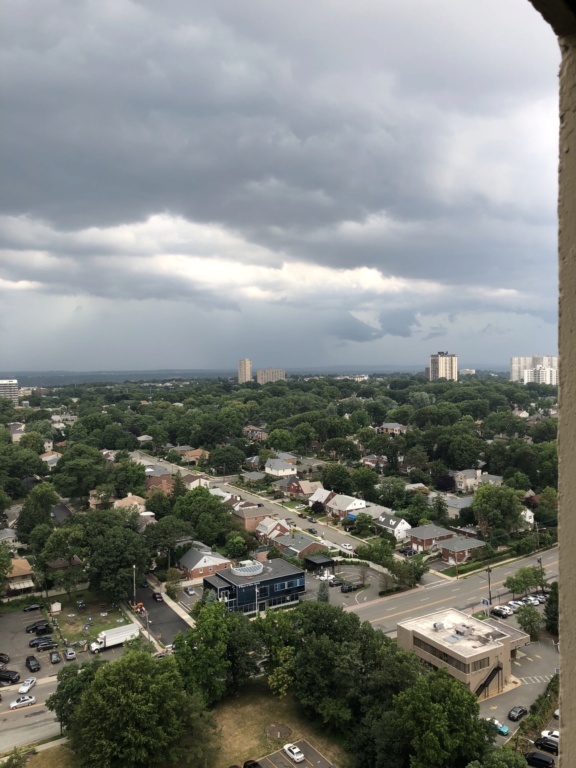 Storm in coming to Ft Lee, picture from 24 th floor looking west to Teterboro Airport ! See the rain line about 1 /2 mile ! Now strong winds and just a big lightning ! Cmc has a 1003mb tropical storm hitting the area. Hrs has a lp as does euro of course cc always overdoes lp. wasn't that bad certainly not like the ones in may. Yeah, actually did not realize it was more than one line, just thought it was a very long back end. Yes theres another line NW of here but it will probably die out before reaching here, the temp has dropped significantly and instability is pretty low if any at all. Speaking of the possible system this weekend 18z GFS has a fully close LP and it tries to develop before turning into the area, this should be interesting to watch if it happens.